The Ritual of Happy Buddha is inspired by the ancient Chinese monk whose legendary smile brought happiness wherever he went. 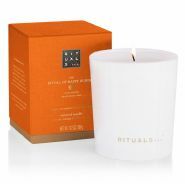 The uplifting fragrance is based on sweet orange and cedar wood and is designed to boost your mood. Create a unique aromatic sensation in your hotel rooms, spa and public areas with this natural perfume spray. Gently spritz to add a personal touch to the room and create a refined atmosphere at any time. The perfume combines the ingredients of Sweet Orange and Cedar, which gives a delicious, warm fragrance.